The Lighthouse Analyst Index is the only regular AR share of voice measure, charting the rise and fall in AR performance of the world’s leading high technology vendors.The chart on the right hand side shows the ten systems suppliers with the highest profile in analyst research over the last six weeks. It is an extract from the Lighthouse Systems Index, one of our monthly share of voice measurements, called the Analyst Index suite. 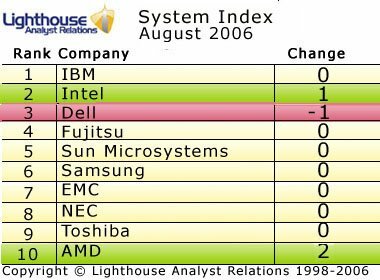 In this month’s top ten Systems Index analysts seem to have increased their focus on AMD causing AMD to move to the position number 10. Also increased analyst focus could be noticed for Intel as Intel steps to 2nd position. On the contrary, Dell moves down to the position number 3. Even though ranking in the top ten of the analyst index appears to have only a few slight changes the top 25 list is more volatile. Symbol and LSI both show great gains in analyst focus by entering the top twenty five. In addition Phillips, Lucent and Panasonic all three ascended by one position. The companies that lost the battle this month and fell out of the top 25 are Hitachi Data Systems and NetApp. If you’d like to be sent the top 25 of the Lighthouse Systems Index each month, please send an email to analysts [at] lighthousear dot com.